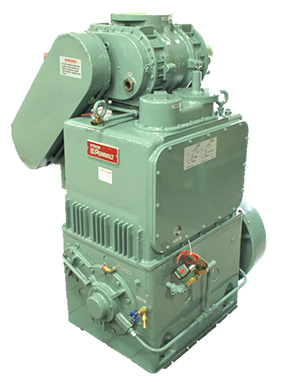 The Stokes 1721 is a pump package that is comprised of the Stokes 212H-11 or 212J-14 mechanical pump with the Stokes 615-1 booster pump. In this configuration, the entire package is mounted on standard sized skid, with the blower mounted on a frame, driven by motor and pulley positioned below it. This package is well regarded as the workhorse of many industries, including Vacuum Heat Treating, Sintering, Vacuum Arc and Induction Melting, as well as many others. This pump package is well suited for mid to large sized vacuum chambers and vacuum systems. All 1721 pump packages share the same data below. Oil Capacity 4 Gallons / 2 Qts.